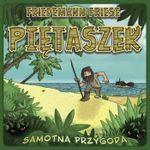 Freitag, the second game in Friese's Freitag-project, (Black Friday was the first) is about Robinson and Friday (Freitag). The player is Freitag and must help Robinson to survive and prepare him for the last two battles against the pirates. Freitag is a deck-building game in which you try to add good cards to the deck and get rid of the bad ones. With this deck you fight against the dangers. If you defeat one danger (card), you will add this card to your deck (good). If you lose against a danger, you lose some health tokens, but you can get rid of the cards you lost with (generally weaker cards). If you lose all of your health tokens: game over; if you defeat both pirates, you win.